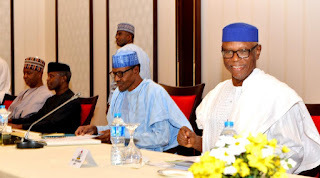 The All Progressives Congress (APC) has said President Muhammadu Buhari’s percieved preference of former governor of Edo State, Adams Oshiomhole, to emerge as the next national chairman of the party was not binding on it. The party also said it will review its timetable for congresses and convention set for May 14. The National Publicity Secretary of the party, Bolaji Abdullahi, made this known to journalists in Abuja. Mr Oshiomhole is expected to challenge incumbent chairman John Odigie-Oyegun for the position although the latter has not formally announced he would seek reelection. Speaking on the issue of Mr Buhari’s choice of Mr Oshiomole as national chairman for the party, Mr Abdullai said the president’s choice was not binding on the party. “What we were told at the meeting was that he was asked who he wanted and he told them his preference which has nothing to do with the meeting today,” he said. He said the review of the timetable was because some governors at the ongoing National Working Committee meeting said dates for the congresses/convention ”are too close”. About a week ago, the party released the timetable showing the schedule of activities from ward congresses to the national convention. “It was a technical meeting that was organised to review our preparedness towards the congresses and convention. It is also to have the opportunity to emphasise to the state governors the need to ensure the congresses were held in a very transparent manner and ensure the processes were free and fair. Because we are aware that some governors have been making statements that we believe have given the impression that we don’t intend to have congresses in some states. Mr Abdullahi also said the list of members of the congresses committees will be ready by Friday. “There were also observations from the side of the governors about the timetable for the congresses and convention, and the observation was that the timetable was closely packed and that it doesn’t leave much room for errors but the observation was that the timetable as it is currently composed was determined because of the Ramadan. We want to be sensitive to the feelings of Muslims who will be fasting in the month of Ramadan. Therefore, we tried avoid conducting any political activity during the month of Ramadan. The Kano State Governor, Abdullahi Ganduje, said another issue raised concerning the timetable was that the congresses were set to hold on weekdays ”which will be a problem as they use schools and secretariats which will not be available on weekdays so they suggested they be conducted on weekends”. He also hinted that if the timetable is changed, the convention might be after the Ramadan. ”In that respect, the NWC has been mandated to go and fashion it out. Also, it may fall within the Ramadan time, we will make consultations to see if only one congress can be held during Ramadan then after Salah we hold the national convention. I think that will be sorted out and the national committee is working on that. Governors present at the meeting were: Abdulaziz Yari of Zamfara; Rochas Okorocha of Imo; Abdulahi Ganduje of Kano; Abubakar Sani Bello of Niger; Abiola Ajimobi of Oyo; Ibikunle Amosun of Ogun; Godwin Obaseki of Edo; Abubakar Badaru of Jigawa; Minnir Yakubu, deputy governor, Katsina State and Ibrahim Geidam of Yobe State.